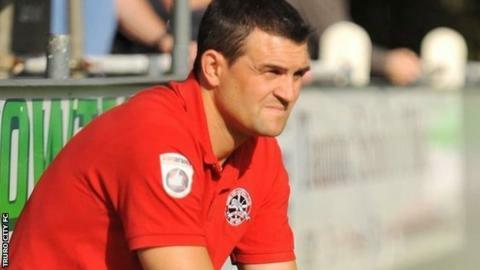 Steve Tully has said Truro City have "nothing to lose" in their FA Trophy second round tie against National League side Macclesfield. It is the first time the White Tigers have gone past the first round of the competition. "It's cup football and you never know what is going to happen, so it is a day to go out and enjoy," the 35-year-old manager told BBC Radio Cornwall. "Training had a bit of an extra buzz to it because of the anticipation." Both sides sit seventh in their respective leagues and are separated by 24 places, with Truro just a point off the promotion places in National League South. Despite the magnitude of the match, Tully has said his players have their feet firmly on the ground. "There is a lot riding on the game and these are the matches the players want to play in," he said. "If you had said to us 18 months ago that we would be seventh in National League South and in the second round of the FA Trophy against Macclesfield at home, people would be pinching themselves. "The players that we have this season are very level-headed and they only look forward to one game at a time." Attacking midfielder Bayan Fenwick joined the squad on Thursday. He was released by Torquay United in December. The 22-year-old made seven appearances for the National League side after signing for them in July 2015 and Tully added it was a "big plus" to bring him in. "Bayan is very good technically and he can play in numerous positions, but mainly up front," Tully explained. "There won't be major changes to our squad. We don't need a lot of players coming in. "But if you add one or two now it boosts the side and it pushes the players even more, so that they have to keep their standards up."